A new book on statutory interpretation has just been published; it’s titled Reading Law: The Interpretation of Legal Texts and it’s by Supreme Court justice Antonin Scalia and usage guru Bryan Garner, who previously co-authored Making Your Case: The Art of Persuading Judges. Scalia’s involvement in this new project isn’t surprising; he’s the leading proponent of “textualism” as a philosophy and method of statutory and constitutional interpretation, and he’s published a book on the subject. Garner’s participation, on the other hand, is something of a surprise. His writings had not previously given any indication that he had any special interest in statutory interpretation. Garner is most widely known as the author a usage manual (he’s actually written two: one on general usage and one legal usage). 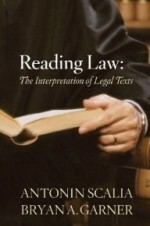 He has also written books of advice about legal writing and frequently lectures on the subject. And he is editor in chief of Black’s Law Dictionary. It is Garner’s involvement that especially piques my interest. Like me, he is interested in language, and a significant part of the book deals with purely linguistic issues such as syntax and word meaning. But Garner comes at these issues from very different point of view than I do, the main difference being that he is generally hostile to the field of linguistics.